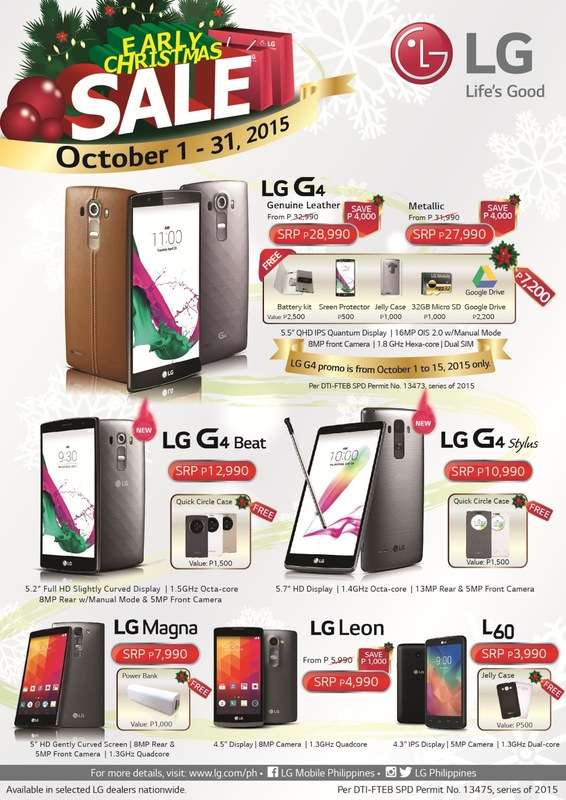 Home Smartphones [SALE ALERT] Celebrate Christmas Early with LG Smartphone Sale! 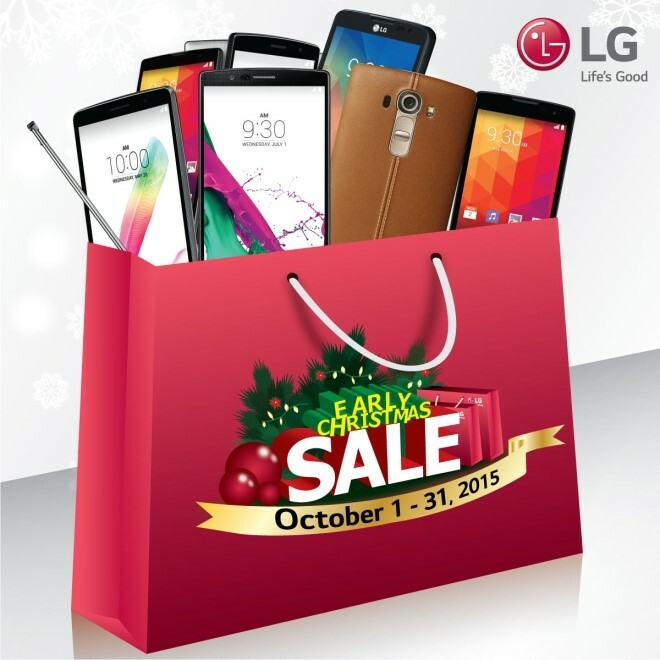 [SALE ALERT] Celebrate Christmas Early with LG Smartphone Sale! For those itching to start their Christmas shopping early, mobile giant LG Electronics provides an early Christmas treat for those who want to get their hands on their latest and hottest smartphones in the market. Consumers can pick their favorite handsets and get exclusive freebies and as much as up to Php 4,000 slashed off from its original price. Bargain hunters can enjoy newcomers in LG’s mid-range smartphone collection which includes the LG Magna and LG Leon. Enjoy the free powerbank that comes when you get the LG Magna which features a 5-inch HD and a sleek gently curved screen, 8-megapixel rear shooter and 5-megapixel front camera for only Php 7,990. LG let’s you save up to Php 1,000 when you get the LG Leon with 4.5-inch display and 8-megapixel rear camera for Php 4,990. For only Php 3,990, get the LG L60 with a free jelly case originally valued at Php 500. The dual SIM smartphone features a 4.3-inch IPS display screen and 5-megapixel rear camera. The LG G4 is the perfect companion this Christmas for the endless parties and noche Buena with friends and family by taking memorable photos with its stunning 16-megapixel OIS rear camera with auto-focus function, wide f/1.8 aperture lens and completely customizable settings thanks to its manual mode that can rival any professional DSLR camera in the market. From October 1 to October 15 ONLY, LG lets you enjoy up to Php 4,000 in savings with freebies worth Php 7,200 when you get the LG G4 during the sale. Get the cozy feel of LG G4’s genuine leather back for only Php 28,990 from its original price of Php 32,990 and the sleek and stylish metallic back cover for only Php 27,990 from Php 31,990. More than that, get the LG G4 exclusive freebies like a battery kit valued at Php 2,500, screen protector valued at Php 500, jelly case valued at Php 1,000, 32GB micro SD card valued at Php, 1,000, and extended 2-year storage space from Google Drive valued at Php 2,200—that’s a total of Php 7,200 worth of freebies! The LG G4 family is finally complete for Christmas with the coming of the LG G4 Stylus and LG G4 Beat. The G4 Stylus is LG’s new phablet featuring a large 5.7-inch HD screen for those who are after better viewing experience for games and movies. It comes with an enhanced rubberdium stylus pen with perfect accuracy and precision perfect for taking notes, surfing the net, doodling, and editing photos taken with its 13-megapixel rear camera and 5-megapixel front camera. With a free Quick Circle Case valued at Php 1,500, the LG G4 Stylus retails at Php 10,990. Completing the LG G4 family is the LG G4 Beat. Inheriting the aesthetic features of the LG G4, the G4 Beat makes an entrance with its 5.2-inch full HD screen with a slightly curved body for perfect grip. Apart from the design and build, the manual mode feature of the LG G4 is also being carried over to its youngest kin. With an 8-megapixel rear shooter, users can also manually adjust settings such as white balance, exposure and aperture levels, shutter speed, and ISO levels. Retailing for only Php 12,990, the LG G4 Beat comes with a free Quick Circle Case valued at Php 1,500. “It has been a good year for LG Electronics so far and we are excited to spread the good Christmas cheer as early as now to our loyal patrons,” says LG Mobile Philippines Vice President Jay Won. Except for the LG G4, LG’s Early Christmas sale runs for the whole month of October. For more details on this festive promo as a complete list of participating stores, visit http://www.lg.com/ph/inside-lg/early-christmas-sale.